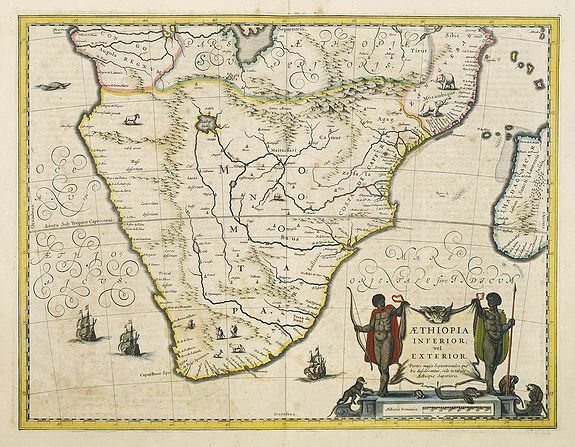 Old map by JANSSONIUS - Aethiopia Inferior vel Exterior. Title: Aethiopia Inferior vel Exterior. Size: 15.0 x 19.3 inches. 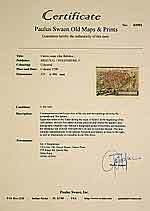 Condition: Paper slightly age toned and some offsetting due to oxidation of ink. French text on verso. The standard map of South Africa throughout the 17th century. The lake out of which the 'Zambere' -the Zambesi- flows is probably based on reports of Lake Ngami, undiscovered until 1849. Then 20 miles long, it is today only marshland. The interior is filled with indigenous animals and ships sail the sea. The large title cartouche is drawn on an ox hide held up by natives, with monkeys and turtles at their feet.